The following figure illustrates the high-level logical components of XBRL. The XBRL Specification defines these high-level logical components and the physical means by which to express them. The following table provides a brief description of each high-level component. the facts used within that XBRL instance. the currency of the fact or some other unit of measure. relating to a fact or that can connect facts together. 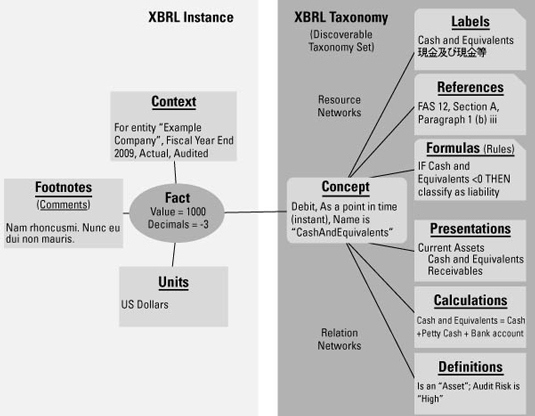 instance or by an XBRL taxonomy. of relations between those dictionary entries. reference, not the references themselves. containing these rules must comply to these rules. renderings of an XBRL instance. any role that explains what type of relation you have created.